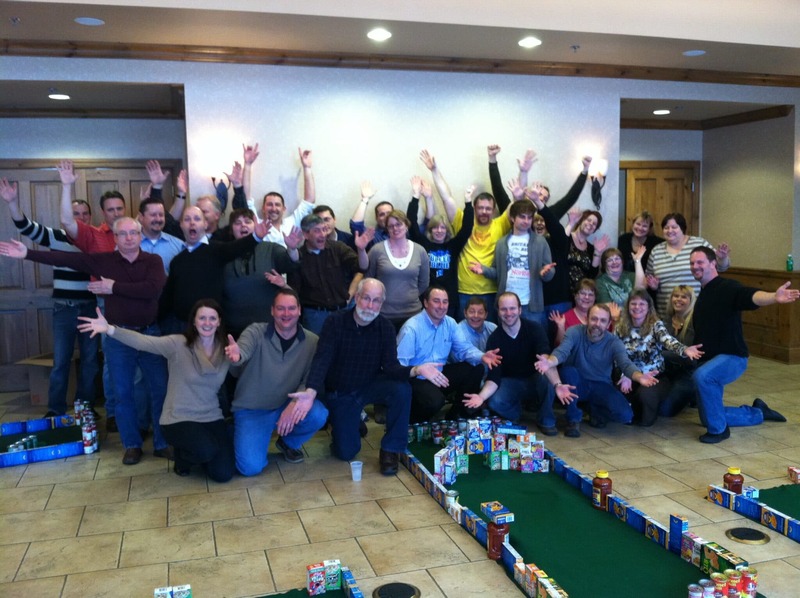 Johnsonville Sausage recently included an Ace Race golf team building workshop in an off-site team meeting in Sheboygan Falls, WI, not far from Milwaukee, Wisconsin. Johnsonville Sausage has been around as a company since 1978 and is known for their quality meat products. They have around 1,300 employees, and now export their products to 30 countries around the world. The workshop involved about 40 members of their MIS team. The goal was to give them a fun experience that got them up and moving from their normally more desk oriented jobs! The Ace Race Golf Team Event began with a couple of quick warm-up activities that get at some of the fundamentals of good team communication. The group shared some laughs and the competitive spirit was high! Moving into the golf event itself, each team created a mini putting green for themselves using non-perishable goods. Each green had a unique design and some included very tricky obstacles! All of the teams then had a race to see which team could get around the entire course first, making a hole-in-one on each green. This group started out a little low-key, but very competitive! 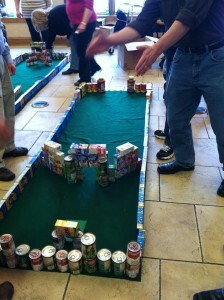 There was a lot of laughter and cheering as they created and then played their course. At the end of the event, they invited The Salvation Army to accept their donation of half a ton of food. While a representative was unable to attend the event due to a last-minute conflict, the organization was very grateful for the generous donation and will use it in the eight food pantries it helps supply around the greater Sheboygan area. Team building workshops that are composed of activities that have a point, coupled with a lot of fun and the opportunity to give back to the community are a great way to get people having fun together. 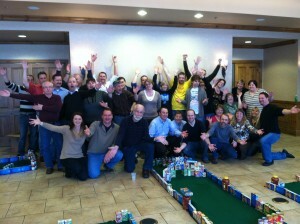 Consider including an Ace Race Team Activity in your next conference and give your team a memorable experience!